For many professionals, speeches inspire quaking anxiety and uncertainty. Provost and Vice Chancellor for Academic Affairs Robert V. Smith has written a book to help those who find themselves stymied at the idea of speaking in front of groups to prepare insightful speeches full of information that will leave the audience engaged and intrigued. 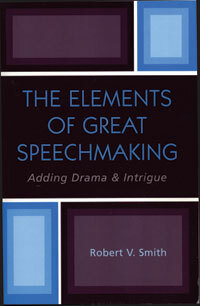 “The Elements of Great Speechmaking” addresses all aspects of presenting information to groups, from the moment of acceptance of a speaking engagement to the last line of the speech. Smith goes deep into the elements that make an excellent speech, instructing the reader on how to add drama and intrigue to a presentation through the use of tools and materials such as humor, quotes, symbols, history, science, literature and props. He demonstrates how to use these elements to create drama and intrigue to a speech from start to finish. The book is divided into four sections: Presentation pre-planning, tools and materials, crafting presentations and making presentations. It also includes lengthy appendices with examples of humor, quotes, proverbs, historical allusions and themes that the reader can use for inspiration.